Dr. Bertha Murray, Mrs. Linda Dilworth, 2018 Beau of the Year Winston W.L. 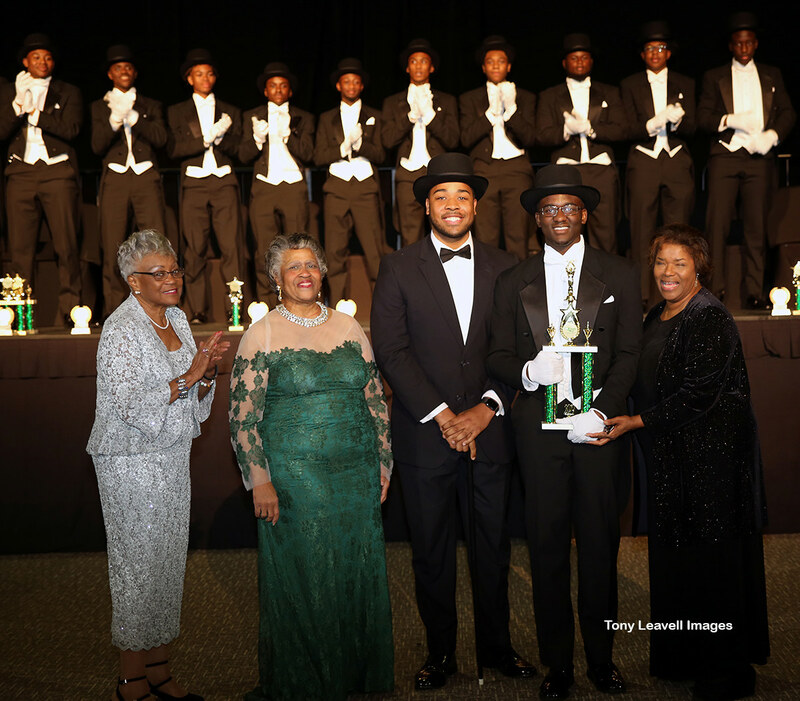 Bogan and Tallahassee Chapter of The Links, Incorporated’s President Mrs. Alexis McMillan present 2019 Beau of the Year trophy to winner Duane Jacques Reece, Jr.
Tallahassee Links hosted over 350 guests at its Ninth Annual Links Beautillion white tie formal presentation held this month, at Al Lawson Multipurpose Center where 19 local high school seniors were celebrated, presented to the community and received more than $13,000 in scholarship awards. The organization developed its Leadership Development, Mentoring, Character Education Program and Links Beautillion as a curriculum based program designed to celebrate the achievements of male high school seniors of color, while also encouraging and inspiring them through participation in high quality leadership, character education and mentoring opportunities. Links Beautillion participants were selected based upon demonstrated achievements in academics, leadership, sports, the arts, community service and church involvement. Beaux participating in the 2019 leadership development and mentoring program included: Zai’Vyon Price and Jalen Randolph of FAMU DRS; Michael Crimbley II, Deldrick Graham, Patrick Holmes II, Donte Jackson, M’Kharis “Tre” Lindsey, Duane Reece, Jr. and McKinley Wilson of Rickards High School; Aaron Ford, Micah Grant, Ryan Hall, and Charles Hruda of Lincoln High School; Kamari Young of Godby High School; Javaris Thomas of Florida State University High School; Carlos Lewis, Jr. and Dekari Thompkins of Lawton Chiles High School; Eljin Rhymes of Maclay Preparatory School and Ivan Tucker of St. John Paul II Catholic High School. The Links Beautillion program featured a seven-week curriculum-based program beginning, with a “Green Coat Ceremony”, signifying leadership and character commitment. It culminated with the White Tie Formal Presentation. The formal program celebrated their leadership, cultural and character enrichment program completion. Aside from mentoring facilitated by The Links and community leaders, participants engaged a leadership and character development program centered around: rites of passage, cultural awareness, leadership development and community service learning. Weekly workshop sessions exposed Links Beaux to extraordinary experiences, information and highlights such as: a Morehouse College Tour; a man-to-man session provided by Col. (Ret.) Ronald Joe; traveled to Washington, D.C., where they toured Howard University, visited the Smithsonian National Museum of African American History and Culture, Capitol Hill, visited the office of Congressman Al Lawson Jr. and stopped in Charlotte, N.C. during their return trip and attended the Charlotte Hornets – Chicago Bulls NBA basketball game; visited the Florida Supreme Court where they engaged in a mock trial facilitated by Judges Gus Aikens, Nina Ashenafi-Richardson and Attorney Annette Pitts; attended an HIV/AIDS Awareness Dance Showcase; were introduced to Caribbean culture, customs and cuisine by the Tallahassee-St. Maarten Foundation; attended a presentation on the Tuskegee Airman and Redtails and experienced a private jet flight provided by Dr. AJ Brickler; participated in a Southwood Golf Course clinic; delivered two community service projects, Projects collecting more than 500 canned goods and nonperishable food items for the local homeless and hungry and also contributed to FAMU SGA’s initiative of purchasing Graduate and Professional School Test Preparation books as student resource materials; learned formal dining etiquette; attended an entrepreneurship presentation provided by former NFL linebacker and local businessman Angelo Crowell; experienced broadcast communications through WFSU 88.9 FM radio interviews on the “Voices that Inspire ” and “411 Teen” programs; and learned to Waltz under the tutelage of acclaimed Tallahassee Ballet Company’s artistic director, Tyrone Brooks and a Hip Hop dance directed by Aurora Hansen, Artistic Director of the Tallahassee Community College Dance Company. The culminating Links Beautillion formal presentation featured the traditional Mothers and Beaux Waltz. Beautillion Mothers and Beaux were later joined in Waltz by Fathers and Links Beautillion Attendants who included: Ayanna Acoff, Jirah Arnold, Solazia Billington, Malone Conner, Porcher Cox, Amiya Debose, Skylar Evans, Marhee Green, Grace Griffin, Ariel Jefferson, Gisele Jones, Carlicia Lewis, NyJuah Nixon, Ashlei Morgan Norton, Imani Maya Sampson, Victoria Smith, Hanna Triplett, Zoie White and Tyrah L. Willia Congressman Lawson issued an inspiring charge to the Beaux, Former Mayor John R. Marks III and his wife Jane lead the Leaders’ Promenade and Waltz and attorney Fred Flowers served as the program’s Griot. Musical inspiration was provided by Darrington Ferguson as accompanied by Brandon Waddles. Links Beautillion awards and scholarships to assist the Beaux’s college education were announced by Debra Austin. Each Beau received a participant trophy and a scholarship award. In addition, superlative award recipients were: Chester Davis Academic Excellence – Charles Hruda, winner; Donte Jackson, second place Academic Excellence; and Ivan Tucker, third place; Outstanding Leadership – McKinley Wilson, winner; Duane Reece, Jr., second place; and Charles Hruda third place; Entrepreneurial Excellence – Duane Reece, Jr. winner; Charles Hruda, second place and Micah Grant third place; Outstanding Community Service – Deldrick Graham, winner; Duane Reece, Jr. second place, and Dekari Thompkins third place; Beaux chose the Best All Around Beau as McKinley Wilson; and the 2019 Beau of the Year winner was Duane Jacques Reece Jr.
Tallahassee Chapter President, Alexis McMillan, said the organization’s membership was most pleased to witness the growth and development of these young gentlemen. She said the Links Beaux’s sense of civic responsibility, leadership, aspiration for professional achievement and enthusiasm in embracing accountability as adults were commendable. The 2019 Links Beautillion was chaired by Linda Dilworth. 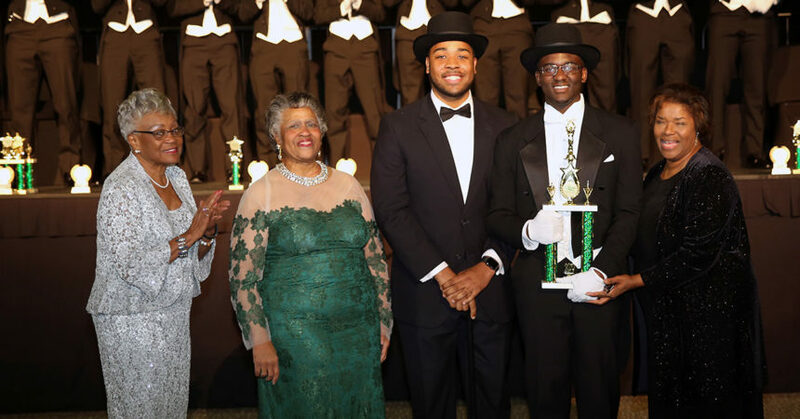 Links Beautillion Dean, Bertha Murray, applauded the Beaux’s program accomplishments and also the zeal with which the curriculum and program agenda were embraced by the 19 selected participants. The 2018 Beau of the Year, Winston W. L. Bogan, a freshman at Tuskegee University, offered a stirring message at the formal event directed to the 2019 Links Beaux. In reflection he challenged the young gentlemen to work hard and prepare themselves to be the future leaders of our nation. The Links, is an international, not-for-profit corporation, established in 1946. The membership consists of more than 15,000 professional women of color in 284 chapters located in 41 states, the District of Columbia and the Commonwealth of The Bahamas. It is one of the nation’s oldest and largest volunteer service organizations of extraordinary women who are committed to enriching, sustaining and ensuring the culture and economic survival of African Americans and other persons of African ancestry. Links members contribute more than 500,000 hours of community service annually – strengthening their communities and enhancing the nation. In 1951, the Tallahassee Chapter was the first chapter chartered in Florida and has a membership of 35 leading African American women in the Tallahassee community. 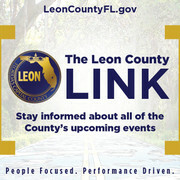 Tallahassee Links’ current program theme is Offering Programs that Teach, Touch and Transform Our Community.